15 Dangerous Roads in India That Only Daredevils Can Drive On! Road trips are considered the new fancy among the travellers, especially in India. Biking along up and down the roads with friends is the next goal. Then they don't remember to care about the unseemly weather situations or the dangerous terrains. Roads, though claimed to be the best means of transportation in the world, are not always too suitable. India, for one, has a nice stock of such roads in the kitty! Placing this at the first position on our list has two reasons. 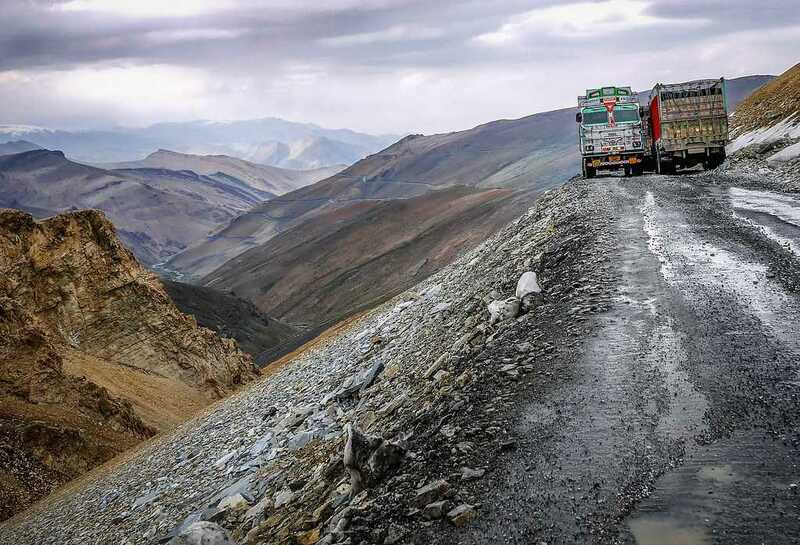 Not only is this Pass the most difficult route to cover, but is also the highest drivable road in India. This route stretches from Leh region in Jammu & Kashmir state in India to Kashgar in China. The height of the Pass located at Ladakh is 5602 meters. Gateway to the Changthang plateau in the Himalayan region is located at a height of 5360 meters. It is the third highest drivable Pass in India which is laden with snow throughout the year. A large number of incidents of choking due to breathlessness have been reported at Chang La Pass. This valley houses the most remote and highest villages in the world. Located in Himachal Pradesh, Spiti Valley invites many adventure seekers for a high adrenaline rush. 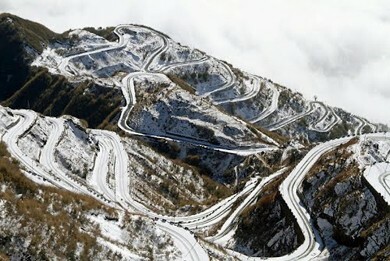 This is an example of a collection of very dangerous roads in a very beautiful landscape. The jaw dropping beauty makes it difficult to resist visiting the place in spite of the harsh warning. This path is located on the Leh-Srinagar Highway at an elevation of 3538 meters. The main reason for it to be listed as one of the most dangerous roads in India is the extreme weather conditions throughout the year. Heavy rains and sudden landslides turn the road into a muddy path which is an invitation to fatal accidents. Kinnaur Road is another beautiful drive with a great not-even-hidden danger. The road is made by cutting the edge of the mountains on the top of Baspa River, which is so low, sometimes you have to peep to see the flowing water. This road connects the Kinnaur District in Himachal Pradesh to the rest of the country. With a high altitude of around 4000 meters, this is another getaway for adventure lovers. Situated at a height of 3979 meters on the eastern Pir Panjal Range of Himalayas, this Pass is one of the most scenic beauties in Manali, Himachal Pradesh. It is traversed by Leh Manali Highway and also forms a great attraction among the tourists, courtesy shooting of many Bollywood films. Topping the list of to-do road trips among youngsters in India is biking from Manali in Himachal Pradesh to Leh in Jammu & Kashmir. Spanning over a distance of 479 km, this road gives you a journey of your dreams. Landscape awe-inspiring and experience surreal- this is the review of the travellers. But some reviews also include the harsh realities of poor weather and pathetic road conditions at some places. This Dangerous road in India is totally worth the adventure! Like other high roads in India, this road is no different in rendering the lifetime of adventure and horror, both at the same time. Nathu La Pass is located on the border of India and China and forms one of the three trade links between the two countries, because of which heavy loaded trucks is not a rare phenomenon. The access to the Pass is also not easy because of too much snow. Also, there is an ATM facility available, the world's highest facility of its kind. Starting from Kochi and ending at Munnar, this 130 km stretch is located on the Western Ghats of India. One of the most renowned hill stations in South India, Munnar is situated at an elevation of 1700 meters. But reaching Munnar is a fun game in itself. The narrow loops and zigzags will give you a horror of the lifetime. This full-of-adventure highway is 285 miles starting from Ambala district in Haryana and reaches the Himalayas rendering great scenic beauty and adrenaline rush to the travellers. The bridges and tunnels on this road are in very poor conditions which make this highway highly prone to fatal accidents. Tirupathi temple is one of the most renowned temples in the world and one of the most populated one too. And to reach this holy pilgrimage in Andhra Pradesh, South India, one has to travel one of the most dangerous roads in India. Filled with deep turns and difficult terrains, this road is highly risky and prone to accidents, especially in monsoons. This series of roads form one of the most beautiful views in the Himalayas. Located at an elevation of 11,200 feet above sea level, this road is another fun ride for adventure junkies. A special permit needs to be made after proper medical checks to be allowed to pass through this road. This road seems to be a perfect road drive, connecting two big metropolia in India. But don't go by the looks of it as the number of accidents that occur on this highway are stunning. This 94 km long stretch witnessed 4234 accidents and 1323 deaths between 2010 and 2015. This road is the lesser known devil, located in the east of Jammu and Kashmir in Kishtwar District. An extraordinarily narrow road without a railing or edges for about 100 miles, this road needs highly skilled drivers if saving your life is on the list. It is a gateway to Kishtwar Kailash base camp located at a height of 6451 meters. Located in the Rajgad district of Maharashtra, this road is full of curves and dangerous turns. With very steep roads, it is one of the most difficult roads to drive on in India. Although the roads are smooth and short in distance, the roads are horrific because of narrow widths. It starts from Neral in Rajgad and ends at the 740 m elevated hill station Matheran. There are many roads in India which are difficult to drive on and invite many accidents throughout the year. They are the most dangerous but also most beautiful landscapes with hills and snow all over, which makes it worth the terror.